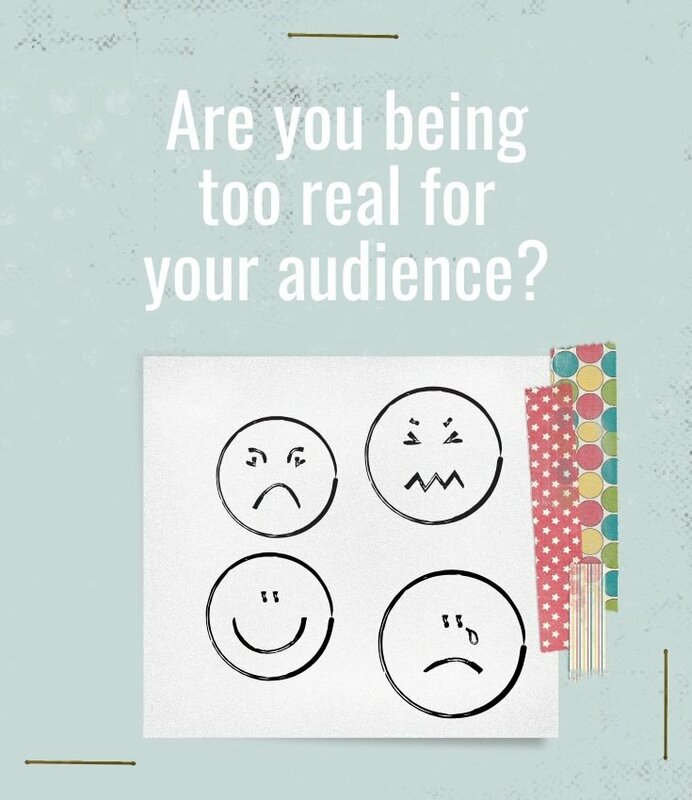 Are You Being Too Real For Your Audience? Keeping It Real. Be The Real You. Be Authentic. You know the drill - build trust and likeability by letting your audience see the real you. But how real is too real? Are you being real or just really awful? Your audience needs more than the edited highlights. Tempting though it may be to populate your blog and social media feeds with the edited highlights from your life, your audience are smart and they will spot the whiff of fakery a mile away. Even if the juicy good stuff you are posting is 100% true, if it's all sunshine and rainbows, you're not being real. To build connection, you need to be relatable, and that means admitting that sometimes you want to cry under the table wrapped in your favourite blanket, mainlining hot chocolate, mumbling ‘this is too hard, I want to go to bed' over and over (just me?). But nobody likes a moaner. Misery loves company, but your potential customers do not want to feel low, so your wailing and gnashing of teeth will drive them away pronto. So you need to be real, but not too real. Sound impossible? Hard, yes. Impossible, no. Here's how you traverse that tightrope. #1 Ask Yourself: Why Am I Sharing This? And Am I Sharing It With The Right People? Before you hit publish, send, or update, read back what you've written, and ask ‘why am I sharing this'? Are you giving an insight into your world because it will add value, teach something, help others? Or are you broadcasting something in the hope that people will respond with kindness and support? There's no right answer here, just ask the question. Then ask yourself, am I sharing it with the right audience, to be able to meet that intention? If you're wanting to educate, inform, help or entertain, share this with your audience of existing and potential customers. But if you're emitting an SOS signal in search of support, find a private way to reach out to a trusted friend, or group of friends. If you get in a funk, there's a temptation to share this uncomfortable feeling with your audience. After all, you want to be real, and right now, you're feeling really crap, so why not be honest about it. But that doesn't help your audience at all. It shows them that even you, someone who they look up to, cannot feel good all the time - and this is disempowering to them. Wait until you've pulled yourself out of the funk, then write a blog post, or longer Facebook update, about that experience. Then you are being real + empowering. You are saying, it's OK to feel this way sometimes, we all feel this way sometimes, this happened to me, and this is what I did about it. This works with positive emotions too. It's more enjoyable to read a Facebook update from someone who's feeling fantastic, but to be honest, it's pretty annoying too. Why do you feel fantastic? How did you get to that point? What can I do to also feel fantastic? Don't go off feeling fantastic on your own, leaving your audience behind you. Take them with you by sharing your story not your feelings. Don't look at your Facebook updates, blog posts or emails in isolation. Each one is a tiny tile in the mosaic that makes up the online version of you. Zoom out and get an overview of the impression you are making. Have you overshared? Not shared enough? Consider the audience and where they are on their journey from being strangers to becoming your superfans? How does what you share help them along that journey? Every few months, scan through your Facebook page and profile, the emails you've sent to your list, your blog posts and any other content you've created, to get an overall feel for the impression you are making. Unless you are super-strict about your security settings and boundaries about who you interact with, chances are your personal social media profiles are read by your current and target customers. That doesn't mean don't use them. Just use them wisely. Every time I get a like, tweet, repin…..and little nugget of affection, I do a little happy dance. Please share the love using the buttons below.